The Animal boys are back at it with their heavy hand. 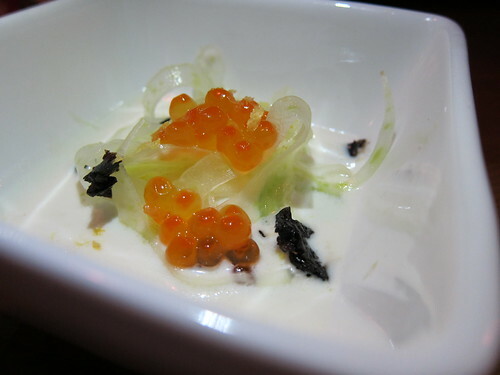 This time, the medium is seafood, and there were certainly more hits than misses when I made my first visit last week. We started out with a lobster roll each, and were all glad that we turned this “shared plate” into a “per person” situation since it’s on the small side. 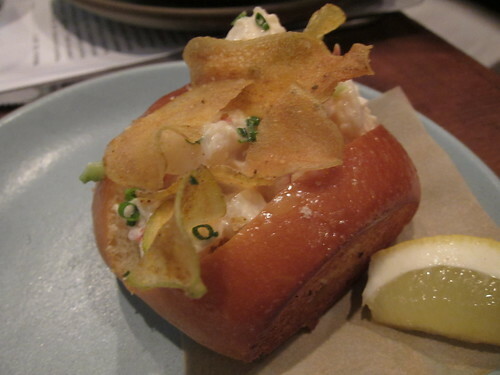 It was a solid, Maine-style (with mayo) lobster roll with chips on top as a nice, crunchy touch and came in an appropriately buttery bun. Case closed. 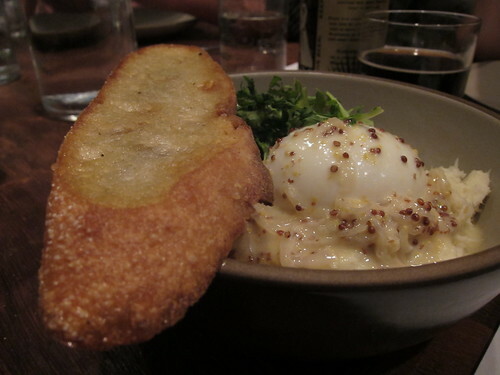 Next came the brandade, which, not to belabor the point, was another essential small plate. The texture of the cod mixture was perfect – not too mushy, not too tacky. The whole grain mustard seeds kicked it up a notch. Though there might have been a period of time not so long ago where I was sick of seeing it everywhere, arugula was a nice choice, here, as the accompanying greens. The bitterness matched the mustard seeds really nicely. Of course, the runny egg with runny yolk is no small detail. What you have here is a bowl full of win. While everything we had thus far was pretty rich, it wasn’t too much. But it was nice to mix things up with the Albacore Tataki, which was seasoned just perfectly with radish, citrus soy and a few sesame seeds. You could taste the freshness of the fish, and tt was a refreshing reprieve from all the other butter-based dishes we had. I’d order it again if only I weren’t so curious about the other fish dishes on the menu (like the Pink Grouper). We had heard that the Fried Chicken Sandwich ($11)Â was a must-order, and so we did exactly that. It had a tasty, peppery breading surrounding hot, tender chicken. The jalapeno coleslaw with pickles was a really nice touch but I actually found myself wishing there were more jalapenos and much more kick in it. It was still solid, though. The Alligator Schnitzel with hearts of palm and oranges ($14) came last, which was really the only miss in our whole meal. 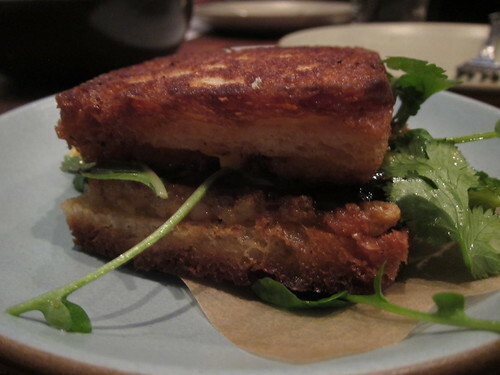 The schnitzel was largely forgettable and seemed an item that was put on the menu in order to widen its range. No matter. There are plenty of other delicious items to try. With the menu changing daily, depending on ingredients, I feel like I had barely scratched the surface that is Son of a Gun. It’s a bustling dining spot with mostly communal tables and walk-inÂ opportunities. They also have a good selection of cocktails (I did enjoy my Sazerac, but consumed it while occupying “standing room only”) which range from $8 – $16 and is only more reason why I feel like I need to go back. Although they’re open until 11 PM or even 1 AM on the weekends, they do run out of favorites. Don’t wait – it’s a really exciting place to eat. Just don’t be surprised if you bump a few elbows; it’s guaranteed you will. I have to admit: It wasn’t my idea to visit Animal. 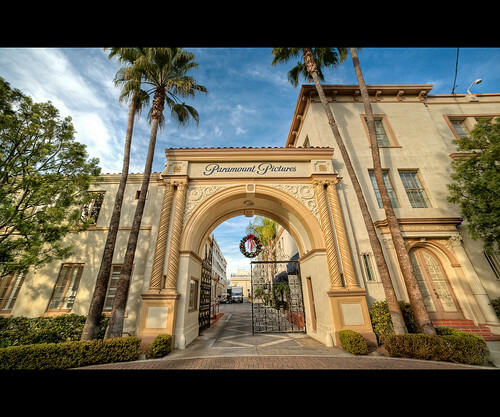 It was good that I had opportunity to go, though – since it was on @gregwong‘s LA hit list as a visiting New Yorker. He’s diligent like that; rather, I am probably lazy. But the unmarked restaurant in the heart of the Fairfax District was a pleasant surprise that exceeded whatever expectations I didn’t have. I was intrigued with the idea that Animal gets its kicks out of including menu items that make you go, “What?” It’s ambitious but the key is that they actually do an incredible job with execution. The menu changes “daily” – although I was able to find online the same menu I ordered off two weeks ago. I find it hard to believe, though, that a menu becomes tired within a 24 hour period. You’ll also notice with these menus that they don’t try and name any of these concoctions with the intent of superficial glorification. Instead, you order each item as in each of its ingredients – as above. As some like to say, Is it what it is? 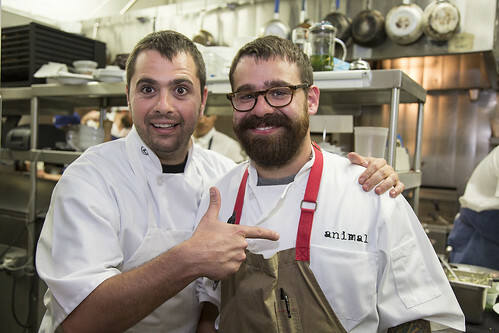 I’m only about a year late since Animal was first opened by Jon Shook and Vinny Dotolo – who were named Food & Wine’s Best New Chefs of 2009. Also on their resume are Iron Chef America appearances and a cookbook on the NPR’s 10 Best of 2008 list. But I’m glad I didn’t know that from the get-go. I like my palate surprised. And varied. 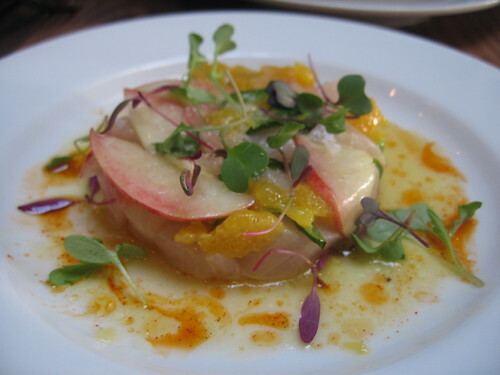 We started off with the amberjack – which was citrusey and refreshing. 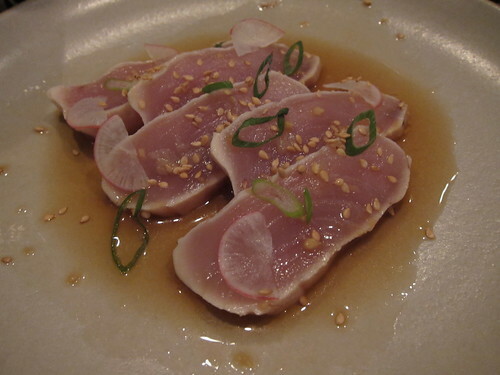 Since it’s in the same family as yellowtail, its tenderness had a texture that was very similar. We then moved on to their variation on a southern favorite, crispy hominy – sprinkled with lime. It’s a nice fried, salty consistency to chew on while also being a departure from your typical calamari. 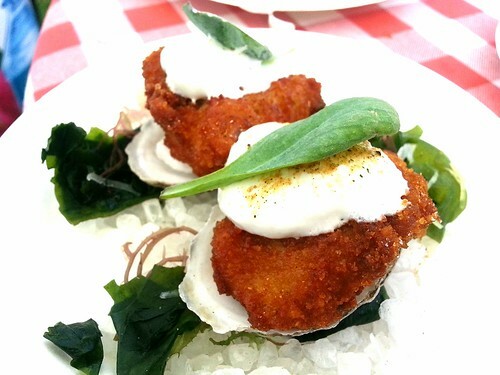 With hominy being corn without the germ – and back in the day doubling as animal feed – its novelty as a gourmet appetizer as presented at Animal comes well-served with a fluffy shell.